The Armadillo Deputies have gone missing as the town goes down the tubes. The Marshal wants them back in action pronto. Note: You do not need to save Armadillo before starting the mission but will after the first cutscene. However, the music and gunfire can drown out the conversation. Wherefore art thou Eli and Jonah? Inside the sheriff office a zombie inmate attacks a living one. Marshal Johnson tells it to stop with no luck and decides to shoot both. He greets John and welcomes him back. He doesn't know what's happening but the usual crimes have gone down as murder and psychotic episodes rise. During this conversation you may notice the familiar young woman outside the window next to the Marshal. Johnson says the town has been nearly overrun a few times and his deputies are missing. John can help keep the town safe but Johnson still needs his deputies. Both Jonah and Eli have been gone for several hours. They were sent out towards the General Store and feared dead. The Marshal gives John a sawed-off shotgun belonging to Jonah and thanks him for helping out. John walks out. Clear out Armadillo if you haven't already. After that go to the marker at the General Store. Inside the store John asks the clerk if he has seen Jonah or Eli. Without hesitation the clerk asks if they are Jews. He goes on to say that the Jews are responsible and how he does not like Jews, colored folk, natives, and a long list of others. He's never met half the people he's listed but he's sure he knows what he's talking about - and how history really happened. John snaps back a little and begins to leave. The clerk takes a crate of bottles outside while asking John to join him in the fight. John refuses so the clerk, revealed as Herbert Moon, will have to fight for his freedom alone. After putting the bottles down he gets attacked by a horde of zombies. John watches the mess before walking away. Go between the buildings into the area marked on the map. 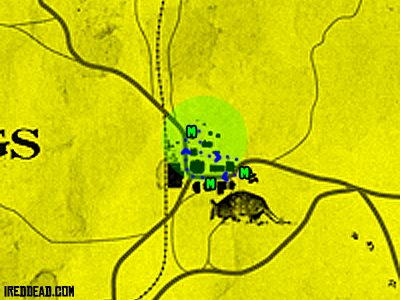 In the pen at the northern end of Armadillo you'll find Jonah and Eli. In a cutscene the two are shown as zombies attacking each other on the ground. John catches their attention so the two stop fighting and focus on John instead, who insists they continue their meal. The two get up and start to attack. Kill both former deputies. With their fate known, head back to Marshal Johnson. John breaks the news to Johnson about the deputies. He hands over the shotgun but Johnson tells him to keep it. With the town safe again, John leaves. You'll probably want to clear Armadillo before starting the mission. Clearing Armadillo isn't too bad. There are a few ways to get up above the zombies. Be warned that sometimes the zombies can get up high as well and attack you or other survivors. You don't need to re-kill Herbert Moon or his attackers but they'll continue to follow you around Armadillo if you don't. Quickly Dead-Eye and place a headshot on Jonah and Eli to make quick work of them.